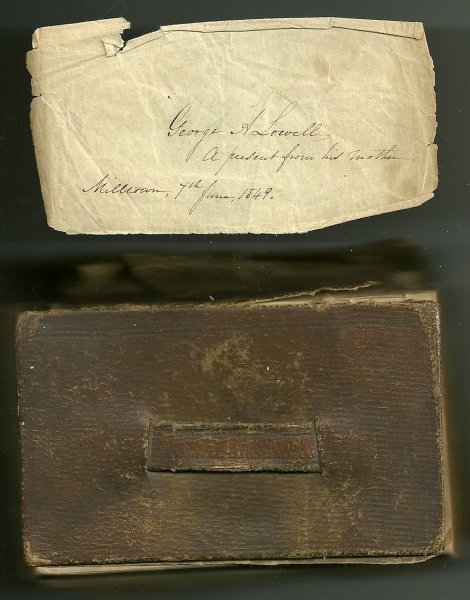 Small Bible with scrap of paper inside indicating the Bible was a gift to George A. Lowell, Milltown, from his mother, 1849, presumably in his mother's handwriting. George Albert Lowell was born May 6, 1831 at Milltown, Calais, Maine, the son of Reuben Lowell and Sarah (Smith) Lowell. George and his brothers went to California during the gold rush. George returned several years later became a merchant, banker and city treasurer of Calais, Maine. See another post that features George's signature as Treasurer of Calais Savings Bank on an 1881 deed where John Prescott and Prescott Moulton Pirington purchased the former Benjamin F. Waite homestead from the Bank. Sarah E. (Hill) Lowell died in 1905 in New York while she and her husband were en route to Florida for a vacation. George died May 29, 1907 in Calais.